Over many years of involvement in music and a long career as a reviewer I’ve reached the conclusion that the industry needs its own form of probation service or at least some electronic tagging system which denies recalcitrant musicians the right to leave their homes unless they repent the errors of their ways. In fact, the next time I meet Tony Blair I’ll make a proposal for some kind of music Tsar or, at the very least, a Tunefinder-General, and remind him that he still hasn’t enacted my suggestion that all pubs should be fitted with a mandatory bodhrán detection device. Now I’m by no means suggesting that the pairing of fiddler ‘Django’ (how the guitarist must be spinning in his grave!) Amerson and guitarist/’singer’ Brian Miller – who plays other things too, but almost as badly – should take heed of short entries in magazines published several thousand miles away, but they must have wise friends who might advise them to take up an alternative interest instead of music. Well, clearly, said amigos are absent for Your Town is even worse than its predecessor. Amerson is unequivocally the worst fiddler I have ever heard. No, perhaps I’d better qualify that – he’s the worst fiddler I’ve ever heard who has the nerve to imagine that others might be interested in his astonishingly awful playing. And both he and Miller clearly need audiological support. I’ve no idea which key Amerson is in on McDonagh’s, but I suspect neither does he nor indeed does Miller. Then there’s his fiddle tone – chalk scraping on a blackboard sounds like a heavenly choir by comparison. I could waste more seconds of my ever-diminishing lifespan on this pair (and I haven’t even mentioned the diabolical singing – which suggests Miller needs to see an ENT specialist pronto), but let me just say that these people need to be stopped and they need to be stopped now! 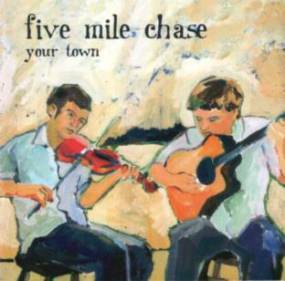 Five Mile Chase have a website, but I don’t see why I should spread any more misery by revealing its details.